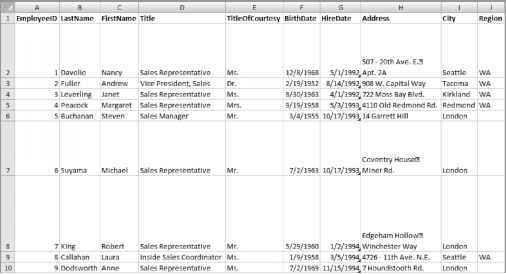 Importing XML data into an Excel workbook is a fairly straightforward process. The Workbook object has a method called XmlImport that does the work for us. Caution Be sure to adjust the file path to reflect your location for the XML file. The ActiveWorkbook object is actually a property of the Application object that returns a Workbook object type, and therefore contains all the properties and methods of the Workbook object. Figure 3-1 shows the ActiveWorkbook object as it appears in the Visual Basic Object Browser. Figure 3-2 shows the Workbook object and its properties and methods. The ActiveWorkbook object has all the properties and methods of the Workbook object. If you try double-clicking the ActiveWorkbook property, you will not find any properties or methods associated with it in the Object Browser. Click the Workbook link in the description section of the Object Browser, however, and you will see the Workbook object's properties and methods listed, as shown in Figure 3-2. Since a reference to the ActiveWorkbook is actually returning a Workbook, you can access all of these properties and methods. I'll present you with a quick example to show that the two objects contain the same class members. Following are two screenshots. Figure 3-3 contains the Immediate window showing IntelliSense for the Workbook object, and Figure 3-4 shows IntelliSense for the ActiveWorkbook object. So if you find yourself examining an object in the Object Browser and you don't see any class members, check to see if it's a property of another object and look at that object's class members. Before we run the code, let's take a look at the Xmllmport function and see what it does (see Figure 3-5). The XmlImport function takes four arguments, as shown in Table 3-1. Path to an XML data file. The XML map to apply when importing the file. Specifies whether or not to overwrite data that has been mapped to the schema map specified in the ImportMap parameter. Set to True to overwrite the data or False to append the new data to the existing data. Specifies the top-left cell of the range that will display the data. The XmlImport function returns a value of type XIXmlImportResult, which is an enum showing the success or failure of the call. Figure 3-6 shows the available options displayed in the Object Browser window. Let's run our GetXMLData procedure and see what we get. If no schema exists for this data, Excel will create one for you, as shown in Figure 3-7. Excel refers to these schemas as XML maps. Click the check box so you won't see this message any longer, and let the import continue. When the import is finished, the data should look like that in Figure 3-8. The URL argument is pointing to a file named cds.xml, which contains discography information. The ImportMap argument is set to Nothing for now because we do not have an existing schema for this data. We are setting Overwrite to True to overwrite any existing data, and the Destination range is setting cell A1 as the target for the start of our data range. If we try to rerun this code as is, we will generate an error, as shown in Figure 3-9. 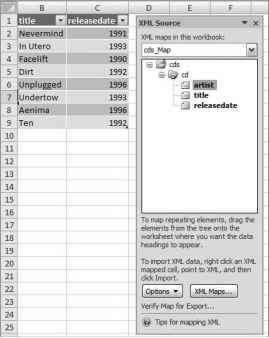 This is due to the fact that the first time we ran the code, Excel created a map for us and bound our data table to it. To view that map, right-click anywhere in the data range and choose XML > XML Source (Figures 3-10 and 3-11). Figure 3-11 shows the XML Source window with the artist element selected. Selecting an element in the XML Source window selects the associated (or mapped) data range. Above the XML map is a drop-down list that contains all of the XML maps in the currently active workbook. The XML map in this project is called cds_Map. The second time the code is run, we run into trouble because Excel automatically creates a new map for the data that is mapped to destination cell A1. Excel will not allow you to bind your data to more than one XML map. If you change the destination cell, the procedure runs fine, however. So how do we refresh our data if a source file is updated? The XMLMaps collection has a DataBinding property that has a Refresh method. Using this method, we can read in any changes to the XML file that our data range is mapped to. Before we begin, let's copy our GetXMLData function into a standard code module in a new workbook and save it. Run the GetXMLData macro from the Developer ribbon. Run the code by pressing the F5 key with the insertion point inside the RefreshXML subroutine. The data range is expanded to include the new data, as shown in Figure 3-12. Remove the new set of nodes and run the RefreshXML method again, and the table will be resized to display only the data from the XML file. Excel 2007 provides other methods to remove and load XML map settings. The DataBinding.ClearSettings method unbinds the data in a range from the XML file. The DataBindings.LoadSettings method takes the file path or URL as an argument to load the mapping from the specified XML file. 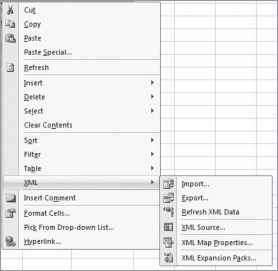 How to delete xml mapping using VBA in excel 2007?